Which data types and connectivity algorithms best capture individual movement? How should we model connectivity? Is it okay to use any biological data type to estimate resistance? What about the connectivity algorithm? Which one(s) should we be using? Anyone estimating connectivity for a species must answer these questions. Yet, there is little guidance in terms of the performance of different data types and connectivity algorithms in capturing the movement of individuals across the landscape. It is generally thought that using movement data derived from steps or paths of telemetered individuals is superior to using static point data for estimating resistance. But if point data from detection surveys, or genetic data, perform just as well, then perhaps we don’t need costly, invasive, and time-consuming collaring studies to model connectivity. 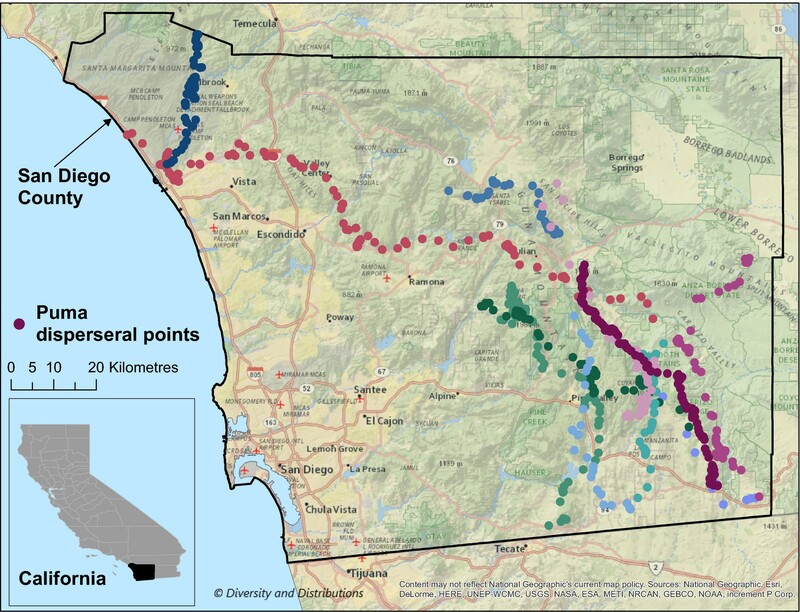 To begin to answer some of these questions, we assessed the performance of a suite of biological data types and connectivity algorithms in capturing the dispersal process of pumas (Puma concolor) in San Diego County in Southern California. We used detection data, point data from GPS collars, path data from GPS collars, and genetic data to estimate resistance. We modeled connectivity across the resistance surfaces using either cost distance or Circuitscape connectivity algorithms. We then used an independent data set of puma dispersal paths to assess the performance of these various approaches in capturing the dispersal process. 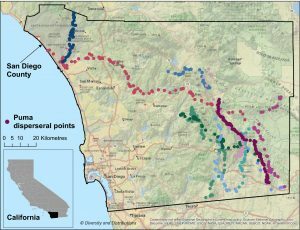 Because many connectivity projects are done in the spirit of applied conservation where identifying corridors is the ultimate goal, one of the ways in which we assessed performance was to construct corridors from the top 10% of connectivity values on each surface, and then calculate the proportion of dispersal points that were located within the corridors. We found that estimating resistance with GPS telemetry data or genetic data, and modeling connectivity with the cost distance algorithm, captured the largest proportion of dispersal points (> 83%). We also found that using GPS telemetry points or paths with the most extreme negative exponential transformation to resistance values captured > 90% of the dispersal points. However, we also found resistance estimated with detection data captured approximately 65%-87% of the dispersal points using either connectivity algorithm. Though the cost distance algorithm generally outperformed Circuitscape when using GPS telemetry or genetic data, the Circuitscape algorithm generally outperformed the cost distance models with detection data. 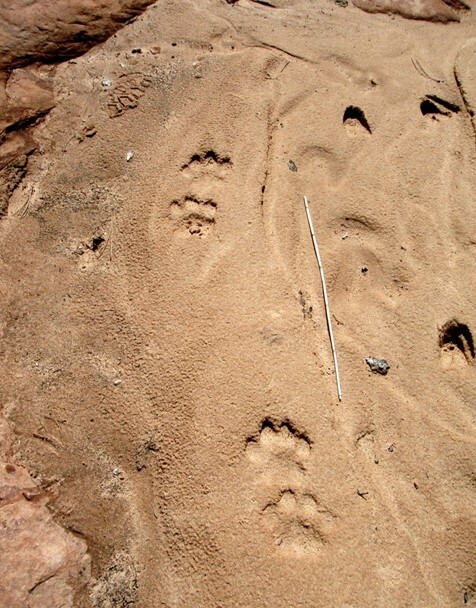 These results suggest that using GPS telemetry or genetic data to estimate resistance are superior to detection data. However, though detection data performed more poorly, it may still be sufficient for estimating resistance. 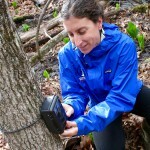 We were only able to conduct our analyses on one species in one study area. More comparative analyses such as these are needed so that we can establish rules of thumb for which biological data type(s) and connectivity algorithm(s) offer the best estimates of connectivity for conservation planning. Zeller, K.A., M.K. Jennings, T.W. Vickers, H.B. Ernest, S.A. Cushman, W.M. Boyce. 2018. Are all data types and connectivity models created equal? Validating connectivity approaches with dispersal data. Diversity and Distributions. Keeley, A.T.H., P.Beier, J.W. Gagnon. 2016. Estimating landsdcape resistance from habitat suitability: Effects of data source and nonlinearities. Landscape Ecology 31:2151-2162.